In today’s digital savvy world, there is nothing more important for a business than web presence. And just presence does not ensure that your business will do well. No matter how big an organization you are, getting the basics of your website right and making it user and search friendly should be the first motive. If you’re not doing that, your business is missing out on so many customers. Investopedia says that “If there is one industry that has the stigma of being old and boring, it would have to be the banking industry”. Though the industry and the banks have started beautifying their processes as much as possible, some banks are still lagging behind. 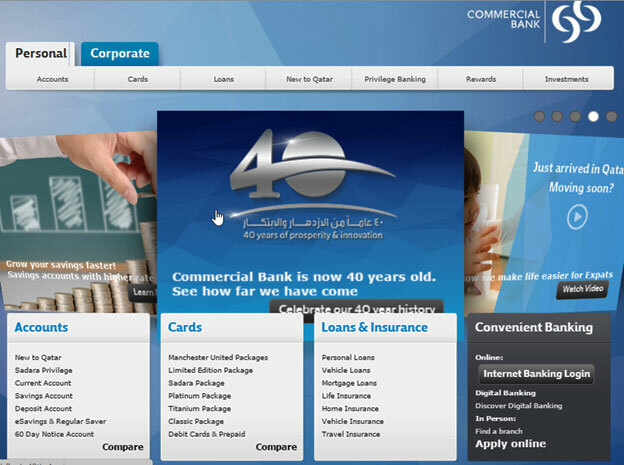 We analyzed the website and Digital Marketing strategy of Commercial bank in Qatar and saw some staggering things. Each problem has been divided into the Why, How, Impact, Observation and Fixes which will explain the points in detail. Why: The website loading time is a factor of Search Rankings. Even in pay per click Search campaigns, the website loading time is a factor in reducing the cost per click. How: Go to Google’s Pagespeed test and enter the site URL. For Desktops, we see a score of 41. This score is out of 100 and the interpretation of this score is, the lower the score, the more the room for improvement. For Mobiles, we see a score of 33. Avoid Landing Page Redirects: – Redirects trigger an additional HTTP request-response cycle and delay page rendering. In the best case, each redirect will add a single roundtrip (HTTP request-response), and in the worst it may result in multiple additional roundtrips to perform the DNS lookup. Avoid Plugins: – Plugins help the browser process special types of web content, such as Flash, Silverlight, and Java. Most mobile devices do not support plugins, and plugins are a leading cause of hangs, crashes, and security incidents in browsers that provide support. Reduce server response time: – Server response time measures how long it takes to load the necessary HTML to begin rend the page from your server, subtracting out the network latency between Google and your server. There may be variance from one run to the next, but the differences should not be too large. In fact, highly variable server response time may indicate an underlying performance issue. Minify CSS:- This rule triggers when Page Speed Insights detects that a page includes render blocking external style sheets, which delay the time to first render. Avoid landing page redirects:- Redirects trigger an additional HTTP request-response cycle and delay page rendering. In the best case, each redirect will add a single roundtrip (HTTP request-response), and in the worst it may result in multiple additional roundtrips to perform the DNS lookup. Optimize images: – Images often account for most of the downloaded bytes on a page. As a result, optimizing images can often yield some of the largest byte savings and performance improvements: the fewer bytes the browser has to download, the less competition there is for the client’s bandwidth and the faster the browser can download and render content on the screen. Leverage browser caching: – Fetching resources over the network is both slow and expensive: the download may require multiple roundtrips between the client and server. Why: The home page is often the most visited page in the site. The slider on the home page is a good place to direct visitors to different sections of the site. It’s used as a tactic to showcase the highlights of the site. How: Go to the home page and check if the slider has clear messaging. The call to action on the slider needs to be clickable and should take the user to different sections of the website. The script that ensures that the slider rotates showing different images does not load properly. This breaks the sliders and all the images are loaded in the background. 3. Is Google Analytics present? Why: Without a proper analytics tool, it will be very difficult to make data driven decisions about the website. How: Either check the source code for (analytics.js or ga.js). Or use a Chrome Extension (Tag Assistant) that will figure this out for you. It is present (UA-6431831-1). However, its outside the <head> tag. You should read more about why this needs to be in the <head> tag here. If the site were to load slowly for some reason and the user closes the window before the page loads properly, if the script were in the <head> tag, it will still be counted as a visit. Poor performing campaigns can often be caught based on high bounce rates. The tag is using the older ga.js script. By this time, Google Analytics has updated their platform and migrated most of the active properties (through the permission by their users) to the more useful analytics.js. Not migrating to this platform represents a risk because after a certain window time (> 2 years), your scripts will stop working (since the platform has moved on and you are using a deprecated script!). 4. Are Google Analytics goals present? Why: Without Goals being properly configured, you will not be able to tell whether the purpose the site was created to meet is being met or not. How: Communications on the website should be focused towards the goal. If there are no clear calls to action across the website, then this is one sign of Goals not being present. If proper events are scripted in GA, then it’s an indication that Goals are configured using events. There could be destination type goals, however without accessing the Google Analytics property, we cannot verify this for certain. There are no additional goal tags on the expected conversion pages (in this case the Contact page, the Accommodation page). Why: Images if properly optimized ensure that the site is loaded fast. Images also have an alt text tag which is a source of keywords from the search perspective. How: Right click on the image and check if the alt tag in the code is present or not. And if present, is it filled or empty! The alt tag is not properly set. We are missing one opportunity to optimize the page for our target keywords. On text browsers (and for the bots), the image does not load. The alt tag is the only piece of information you have to describe the image. Fix (Simple): Each image can have an alt tag clearly describing the image. Why: 40% of all internet traffic is via Mobiles and Handhelds. Your website has to be mobile friendly. 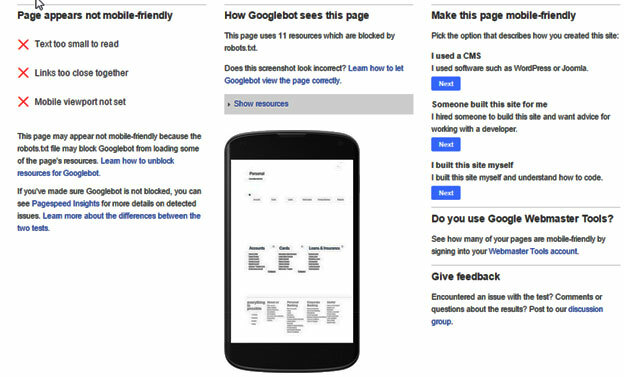 How: Check with the Mobile Friendly Testing tool that Google provides. Why: Your XML based sitemaps, not indexing properly website to Google Webmaster Tools. If this is not done, then the site will not be completely indexed (orphan pages). Image sitemaps can also increase search visibility for all the pages where you have good looking images included. Observations: Sitemaps are present on the website which helps all the pages on the site to get crawled by spiders on the web. Why: Every website, especially one representing an organization, needs to have a clear reason for existence, and that is to get its visitors to do something (e.g. sell, buy, leave their information, schedule an appointment, request a whitepaper etc). Visitors must get a clear idea of what is the intended action for them on the website on first look. Every other action should actually be tuned to push them towards the key action. In addition to the site’s end goal, every page must have a reason of existence, i.e. a call to action, or content that the user wants to consume that is not available elsewhere on the site. How: Observing the structure of the page on first look. Is it clear what you are expected to do as a user? What is the end goal of the page? Do this for every page of the site. Observations: The homepage has a set of calls to action at the top. Alternatively, there could be better CTA on the slider. Adding a real-time chat can be a great way to help the site users. Fix: Design the user flow funnel for the website and each page within. The most desirable action of the user should be highlighted prominently and placed in a conspicuous and attractive location on the page. Why: Properly termed meta descriptions for the pages help in convincing the search user to click on your listings. If the meta description, however, were not properly worded, then even though the site is getting high search rankings, it may not get as much organic traffic. How: Search for site:omantourism.gov.om and observe the meta descriptions. The homepage has been given a great description and the sitelinks makes the search really easy for users to navigate along. Fix (Simple): For each and every page,the meta description needs to be articulated and updated in the CMS. Why: A simple and user friendly URL helps people quickly navigate through a site. Having too lengthy a URL or an obfuscated a URL ensures that people cannot simply type that URL in their browsers. 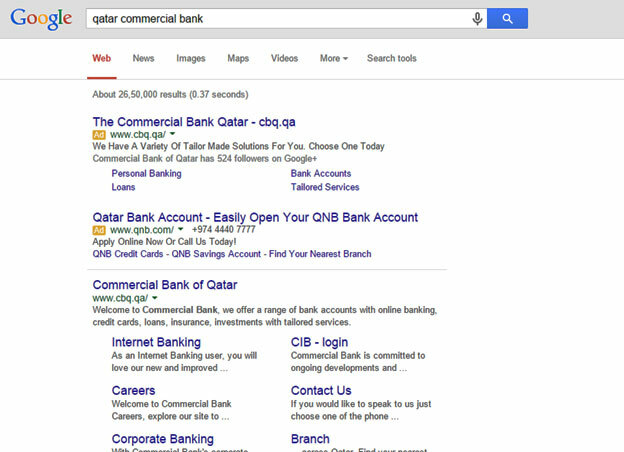 How: Search for site: www.cbq.qa and observe the URL structure. The /EN/Personal/Pages/default.aspx is consistently appearing in all the URLs. This is redundant. The home page URL is too long, when you are putting a redirect from the main domain (http://www.cbq.qa/) to such a long URL, you are slowly hurting your domain search visibility. Fix (Advanced): The URL structure needs to be redefined. And with Google planning to present URLs betterin the search results, this becomes extremely important for better user experience. Why: With the market becoming more and more competitive and Google allowing companies to bid on competitors keywords, it is very important to make sure you have a presence for all your branded keywords. How: In your adwords account, create a “brand” campaign and include all the possible brand keywords and abbreviations. The clicks will not be expensive because the relevance is high and the quality score will also be good. Impact: Sometimes, not bidding on your brand keywords can give an opportunity to other companies to target your customers and leverage something out of them. 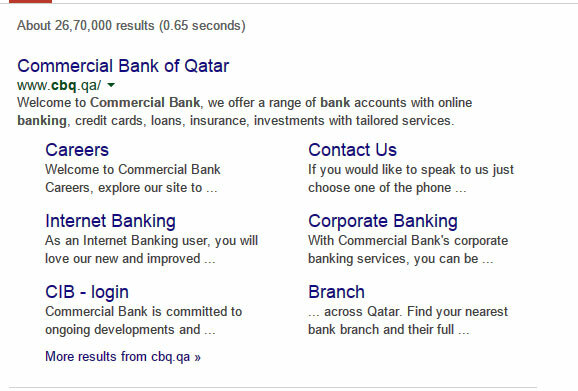 In this case, you can clearly see that Qatar Bank account is bidding on CBQ’s brand keyword. If CBQ were not bidding, they might have lost out on potential customers. We hope that you are not making the same mistakes as CBQ and even if you have committed any of these then you will be smart enough to get them fixed. If you have any other queries then do mention it in the comments box below and we shall get back to you at the earliest. Previous Myths about FRM: Busted! Digital Marketing Mobile friendly website Website management website promotion.